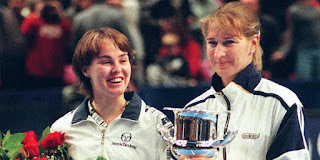 In 1996, around the end of November, Stephanie ‘Steffi’ Graf won the season-ending WTA Tour Championships. It was not the fact that she won that was particularly surprising. Steffi had won the last 6 Grand Slam tournaments she had played (remaining absent from the Australian Open in 1995 and 1996) and was generally the odds-on favourite to win whatever she played. It was that she had been taken to five sets (the WTA Tour Final was the only women's match played over best-of-five, and this was the last such match, I think, they reverted to best-of-three after that). Even more surprising was that a girl who had just turned 16 had stretched her that far. 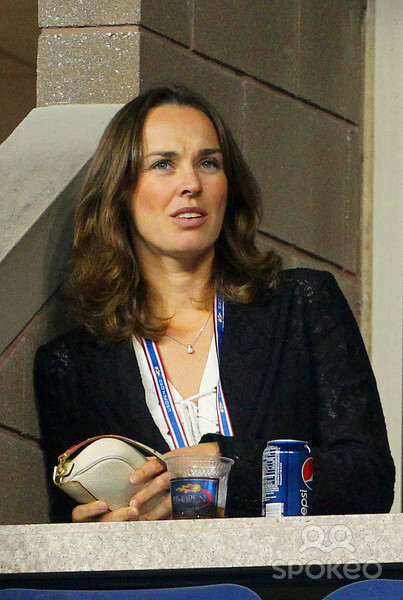 Martina Hingis, the girl in question, was a phenomenon. She burst upon the scene by winning a doubles title at Wimbledon in 1996 and followed it up by winning 3 of the 4 singles slams in 1997 (losing the French Open final to Iva Majoli, a shocker of a result). She had a delicate touch, an extraordinary skill and a head for angles and reading a point that, for a heady period of about 30 months, compensated for the fact that she had a weak serve and lacked power in her groundstrokes. At 16, she was the dominant player on the women’s circuit, with Steffi Graf in semi-retirement and Monica Seles never quite the same player after the horrific stabbing incident that wrecked her health and her confidence. But she was also fun. With a broad smile, a perky nose and mischievous eyes, she came across as thoroughly real, a precocious child, not a tennis robot or even the ‘forced into playing’ phenomenon that had become so common in those days. And with teenage came its other idiosyncrasies – she loved to party, she was capable of petty jealousy (ever wondered why the Hingis – Kournikova doubles combination played so little together in spite of their remarkable success? ), and capable of saying things I hope she regretted when older (the most blatant being her homophobic remarks about Amelie Mauresmo). It was, anyway, easy to overlook, for me at least. In an era where tennis was fast becoming an ugly, brute-force contest, it was nothing but wonderful to see a player who could uncork a picture-perfect lob, a running drop-shot and a cross-court half-volley, sometimes all in the course of the same point. I would, of course, be hypocritical if I denied that I also found her easy on the eye. In January of 1998, I used to attend a ‘Tuition class’ in (shudder!) Andheri. 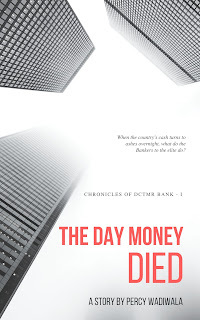 The day began at some ungodly hour of morning and classes continued through the day to late afternoon. The Australian Open Ladies final happened while I was being taught the finer nuances of some accounting concept. I spent every break in lectures looking for an afternoon tabloid in the hopes it would carry the result. Eventually, I found a copy of the Mid-Day, with the front page header – ‘Hingis defends title at Melbourne’. I do not remember much of anything else I learned that day, but I do know that had Conchita Martinez won, I would have been mightily upset. I may even have cried. As it was, I virtually cradled that newspaper in my arms as I went home by bus, a big smile plastered on my face. 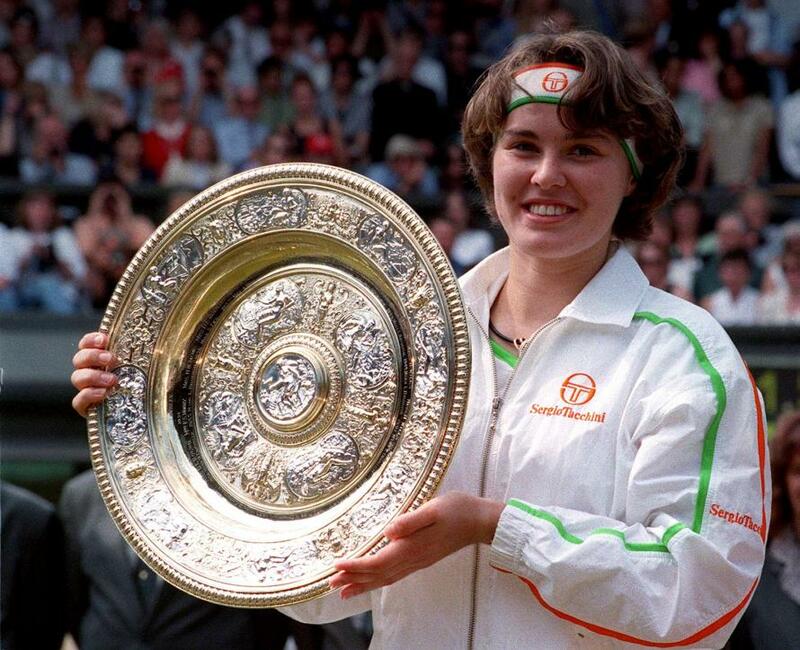 It seemed as though she was living up to her promise, and I, as her devoted fan, was glad that at last (my other great favourite, Goran Ivanisevic, was an exercise in self-torture) I was supporting someone who would give years of the same, wonderful, winning feeling. But 1998 would also be when we saw the first signs that she would never become the dominant force it seemed she was destined to be; she would fall in the Semis at Roland Garros and Wimbledon before losing the US Open finals to Lindsay Davenport. In 1999, she would display shocking bad temper following a loss to Steffi Graf at the French Open finals before having a terrible meltdown in the Wimbledon first round against Jelena Dokic. When she reached the finals of the US Open, though, and was to square off against a player who was only known for being someone's younger sister, it seemed as though things were coming back on track. Instead, she would lose to Serena Williams (hallowed be Her name) in straight sets, and that was when I knew that there would be no era of dominance. At least, not for Martina Hingis. Not that Martina gave up. She had another Australian Open in her, winning in 1999 against Amelie Mauresmo, and she continued to make deep inroads into Slams, often felling two of the big hitters – the Williamses, Davenport, Capriati and Mauresmo – before falling to a third in a final or semi. 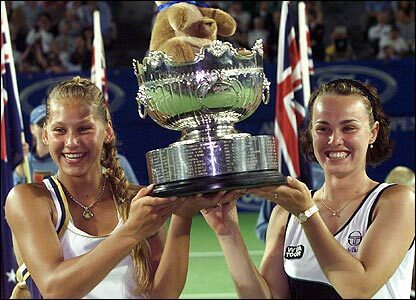 On the doubles circuit, she changed partners as often as she changed boyfriends off-court and still won – the best women’s doubles team was always ‘Hingis and whoever’ as long as she was playing. Then, in 2002, after making her sixth consecutive Australian Open singles final, she declared she had an injury and sat out the French Open and Wimbledon before making a run to the fourth round at the US Open. She would announce retirement after that, claiming a foot injury, and sue her shoe sponsor in the off-season. It seemed tacky, even cynical, for those who suspected her frustration at being unable to overcome the weaknesses in her own game was the real reason. But my love for tennis, even sport in general, was on the decline. I would admire Roger Federer, I would be awed by Nadal, I would worship at the altar of Serena (In Whose Grace We Trust) but I would never love a player again. I would never stand desperately around newspaper stalls, or later, smartphones, looking for a result, I would never be tearful, or angry, or ecstatic, because of a sporting result. Hingis made a comeback in 2006, and made three Quarter-finals before retiring again, this time under rather shameful circumstances, having tested positive for cocaine use. It is not a performance-enhancing drug, of course, but that, if anything, made it even more believable. 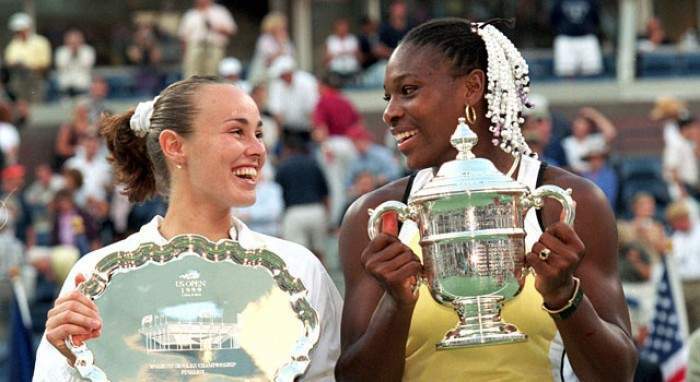 Hingis had always liked to defy conventions and morality, riding horses when the tale of Maureen ‘Little Mo’ Connolly is on every true tennis-fan’s mind, spending a night with Justin Gimelstob during a Slam, taking off for a beach vacation a day after that first-round loss to Jelena Dokic. The last comeback was in 2014, and this time, she chose to play only doubles. 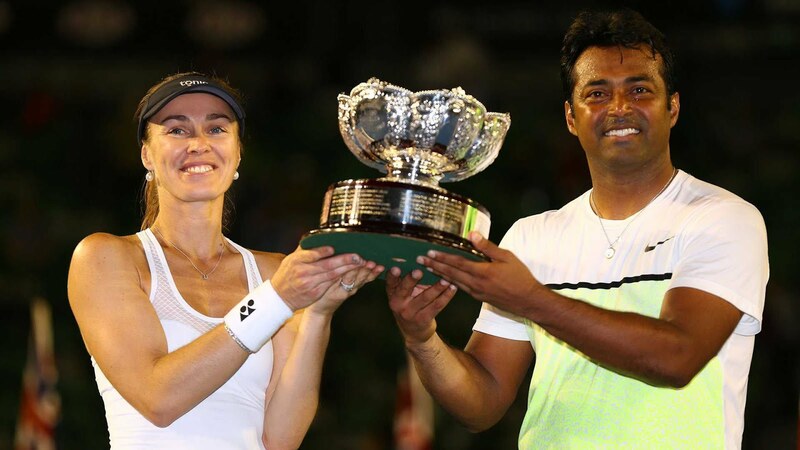 It was a wise decision, and in bits and pieces – for even when she partnered Sania Mirza and Leander Paes, only finals were broadcast in India; in the US, even less – I got to relive the beauty that had characterised her heyday. There were the lobs and drop-shots, the cross-volleys and the exquisite hand-control that had made her such an extraordinary player to watch. And now, she retires again, having won both the women’s and the mixed doubles events at the US Open, with a relatively inexperienced and unknown partner in the women’s event at least, and making a respectable run to the semi-finals of the WTA Tour finals, 21 years after she had heralded her presence to the world at the same event by running the great Steffi Graf to five sets. May it be a happy retirement this time, Martina. May there be horses and laughter and parties and whatever else makes you happy. The game goes on, as it did before and as it will now, and as it will even after she retires, the one who rightfully claimed the title that for a while we all thought would be yours. But for a boy who stood outside a newspaper vendor’s stall in Andheri in 1998, desperately waiting to find out whether you had won a match and for whom that news made the difference between tears and happiness, a part of his life will go with you into retirement, never to make a comeback. Ah! What a post, Percy! Only a true fan could write such A Farewell to Arms! Her arms which have served and lobbed to glory do need rest after more than two decades of constant training and match play. Serena has, and deservingly so, achieved true greatness, perhaps joining Court or even leaping beyond her but to some MH, with all her faults and foibles, will always be the people's champion. She might never have ascended to the pinnacle but she will, like another princess, hold a place forever in tennis lovers' hearts and souls. Indeed thou make me sob, Doc. True this is.